Generation 2 nuclear reactors This refers to the class of commercial reactors built up to the end of the 1990s. These are Boiling Water Reactors, (BWRs) as at Fukushima Dai-ichi power plant. They are in operation today at many other places, at least 23, and probably more, in USA. (above Vermont Yankee nuclear reactor) Generation II reactor designs generally had an original design life of 30 or 40 years. However many generation II reactor are being life-extended to 50 or 60 years, and even to 80 years, despite serious safety doubts! Advanced Boiling Water Reactor (ABWR) — A GE design that first went online in Japan in 1996. Advanced Pressurized Water Reactor (APWR) — developed by Mitsubishi Heavy Industries. Enhanced CANDU 6 (EC6) — developed by Atomic Energy of Canada Limited. 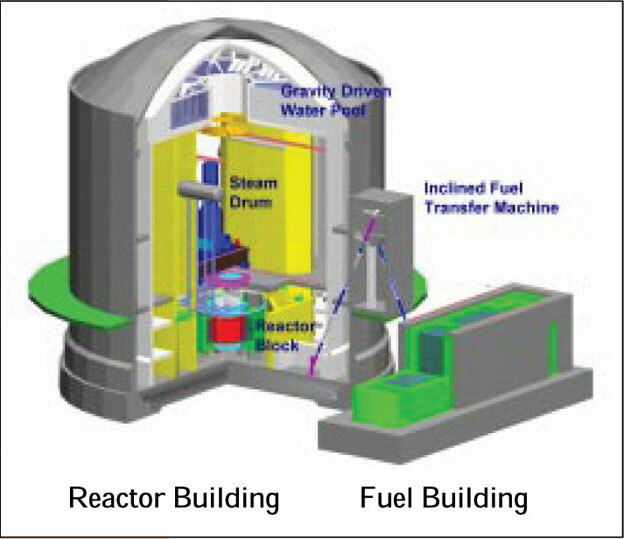 Advanced Heavy Water Reactor being developed by BARC,India to utilize Thorium. The reactors operate at relatively low temperatures, leaving the bulk of the fuel unburned as waste. In fact, only less than 1% of the fuel is converted into useful energy. This creates an enormous amount of radioactive nuclear waste. In particular, some of the transuranic elements produced by the process have enormously long half-lives. Generation IV nuclear reactors. Unlike Gen III+, which evolved from existing Pressurized Water Reactors (PWRs) and Boiling Water Reactors (BWRs), these would be based on radical new technologies. Six technologies were selected by the major nuclear countries as the most promising. Generation 1V nuclear reactors are in general “fast breeder” reactors, designed to produce more nuclear fuel than they consume. Nuclear reprocessing separates plutonium from the used nuclear fuel. Originally this was done to get plutonium for nuclear bombs. More recently, reprocessing has become part of the technology for breeder reactors. However, these reactors designed to use plutonium wastes in Mixed Oxide Fuel (MOX) have turned out to be an environmental and economic disaster, for example at Sellafield in England, and at Monju in Japan. Westinghouse AP 1000 it was clear that the AP600 was hopelessly uneconomic, so Westinghouse nearly doubled its output in the AP1000, which received final regulatory approval in December 2011. The AP1000 is still proving far too expensive and China is now examining the possibility of scaling it up to 1,800 MWh to reduce cost. Integral fast Reactors Generation IV reactor designs are largely Fast Neutron Reactors, that can consume nuclear waste through fission. Since the 1950s, roughly $100 billion has been spent on the research and development of such reactors around the world, yet there is currently only one producing electricity—the BN-600 reactor in Russia, operational since 1980….. The most prevalent type operate at temperatures as high as 550 degrees Celsius and use liquid sodium instead of water as a coolant. Sodium burns explosively when exposed to either air or water, necessitating elaborate safety controls….. But attempts to make that technology commercial have largely failed, mostly because of difficulties with controlling sodium fires and the steam generators that transfer heat from the sodium to water. Travelling wave reactors, – Bill Gates’ baby – Terra Power – touted as cheap, but in reality the costs are unknown. Thorium 233 beta decays (HL 22 minutes) to proactinium 233, which beta decays (HL 27 days) to uranium 233. Uranium 233 is fissionable, and you can make bombs out of it. And the best part of all is that it can be purified chemically out of the spent fuel of the thorium reactor. You don’t have to mess around with gas diffusion or centrifuges. If, as some propose, there’s a thorium reactor buried in every backyard, you could face the possibility of pretty much any dedicated extremist being able to build nuclear weapons. The Greenroom » Nuclear Weapons for the Masses!